Because of bones’ three-dimensional qualities, transparencies placed underneath them still show up. Along with these, we used the drawings and notes of Charles Darwin to create Sunprint collages. Ernst Haeckel was a German biologist and artist. 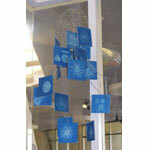 The stunning drawings from his 1862 Monograph on Radiolarians have inspired everything from lamps to large scale architecture, and we decided to use them to make a mobile. Jared Tarbell is an artist who “write[s] computer programs to create graphic images.” I made prints of the computation images, and the results were striking. Be sure to check him out at complexification.net.